Experience the flavors which have Zagat Survey, respondents clamoring to "visit this lovely local treasure, where the Italian dishes are spun with an imaginative twist and are made with exquisite care." 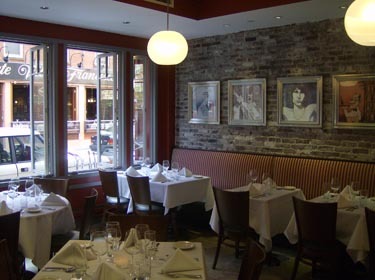 On a nightly basis, the menu at this cozy, neighborhood favorite offers diners unmatched recipes of homemade pasta dishes, grilled meats, succulent New England seafood and locally farmed produce. Chef Jorge Mendoza expresses his passion for food with culinary techniques inspired by the Mendoza family's Italian heritage. The Vinoteca di Monica wine list reflects years of research and gathering. Wine selections range from regional varietals to select vintages, with a focus on the true representation of each geographic region. To complement the characteristics of the wines, the culinary approach is simple: we are dedicated to preserving the cultural crafts that make wine and food so special.